This choice of is a relatively modern move, which became quite popular from the late 1980s onward. The aim of the move is to keep sente. In professional play, a has been the common response. Since the advent of strong bots, has been the default move in the invasion patterns, and b is the default response. 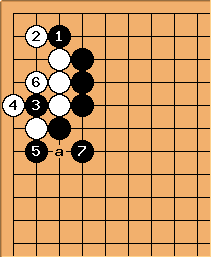 After the - - exchange, Black can play away, if the board is mostly empty, to be the first to play in an either empty or 1 stone corner. The price for playing away is that White can play a. Black remains with a wall without extension. AI bots have evaluated this as playable for Black. 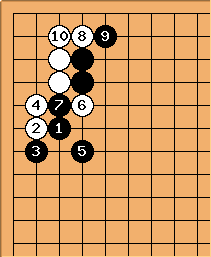 If Black plays a himself, White will play b and either take sente or hane at the head & foot of 2 stones. If Black continues here, he should do so at b or c.
If Black plays double hane at , White will take the stone, giving Black a forcing sequence up to . Then Black plays elsewhere, leaving a big point at a. White can resist like this. She gets out in sente with , but Black makes a lot of profit and gets central influence. 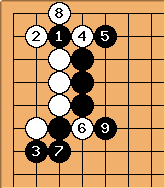 Using the combination of inside and outside hane, Black takes influence but now with sente, while White gets out. Black can also stop White from going into the top side, but at the expense of losing sente. White can play here. 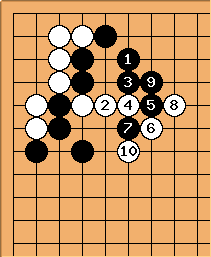 If extends, we revert to this pattern and Black loses sente. So, should hane and we get a fight. We get this rather amazing sacrifice. 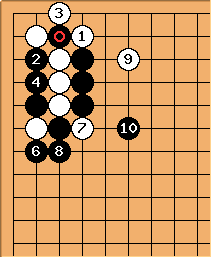 White has the corner and outside influence. Black has a strong group and sente.